Sediment filter, used only in the Jupiter Athena. With 1 micron absolute filtration this new and improved sediment filter is capable of filtering out contaminants up to 5 times smaller than that of the original filter. 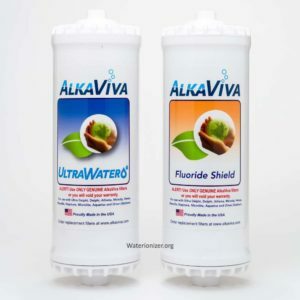 Please refer to the filter fit guide below for what filter to put in position #2 of your Athena ionizer, or see the Ultrawater-Fluoride Arsenic Shield filter package for Athena. To view a video on how to change your Athena filter(s), click here. The X indicates what filter will fit in your ionizer. If there are multiple X’s, it means you can choose what filter yAthenat. For further information on ordering filters please call us on 1 877-770-5247. * The Biostone UF (Ultrafine) filter is especially useful for use with well water, or for people with higher than usual sensitivity to bacteria and other contaminants. It is not necessary to order an Ultrafine filter if you are on municipally treated water.